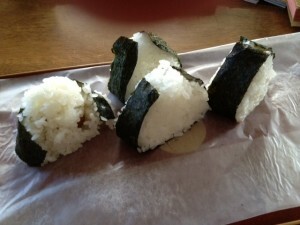 Wanda's onigiri: Not pretty;but tender, satisfying morsels. I wish I could show you the meal I made tonight when my husband’s new BFF and his wife came to dinner. But, well, we did it again: ate before shooting. Ex cept for one dish, the onigiri (musubi rice balls) above. For some reason—I rarely cook Asian food—I went in a Japanese direction: edamame with garlic, onigiri (omusubi) with ume, gyoza (pork dumplings), tempura shrimp and Okinawan sweet potato. I was sooooo proud of my onigiri; they wouldn’t have made the cut at any self-respecting sushi shop or at my mentor’s, Manabu. They were misshapen and not consistently sized but they held together, the rice was starchily tender and the nori (seaweed) wrapping still crisp. Oishi-desu! (Delicious!). I’m struttin’ around like a samurai peacock. Not my best moment, however, was where I cut a corner. I bought a tempura batter mix.. My homemade tempura batter is feather-light, puffy, pure-flavored, never too thick. Perfect. This stuff was godawful: I might as well have used Bisquick. It was salty, thick, nasty. I could tell it was a bad idea from Moment One. Ruined a bunch of perfectly good shrimp and sweet potato. Why I bought a mix when a professional chef was coming to dinner with his Japanese wife…all I can say is I was tired when I was grocery shopping. Note to self: Never shop when tired. Note to self: Hide the leftover onigiri (for my midnight snack). Note to self: Call Manabu and ask for another lesson. In Hawai‘i, tempura—batter-fried fish and vegetables—is commonly encased in a thick coating of oil-soaked batter. Room temperature, hours-old tempura is sold in okazuya (Japanese delicatessens) and served at parties. What a difference from the tempura philosophy of its homeland! In Japan and in Hawaii Japanese restaurants and izakaya (taverns) run by Japanese, tempura is a dish of the moment. It’s prepared only to order, in small batches, with the thinnest of batters and eaten hot or not at all. Essential to the Japanese method are cold ingredients and hot oil. To make Japan-style tempura for a party, draft someone to staff a tempura station a tabletop gas or electric burner placed right in the party room. Or appoint someone to ferry the dishes to guests from the kitchen. Pour a generous amount of soy sauce into a shallow baking dish and marinate sweet potato slices in the liquid 10 to15 minutes. Drain, wipe dry, and refrigerate. While the sweet potato chills, in a large heavy pot or deep fryer, heat 3 inches of oil to 350 degrees F (use a cooking thermometer that clips onto the side of the pot, or stand a wooden chopstick upright in the pan. If it immediately creates bubbles, the oil is hot enough). Put ice in a large bowl and nestle another, smaller bowl inside the ice. In the smaller bowl, combine cornstarch, flour, salt, ice water, and beaten egg and whisk briefly (a few lumps are okay; overbeating makes the batter gluey). Put nested bowls near frying station. Have ready a rack or paper towels for draining and small, decorative serving plates. n serving plates and serve immediately with grated ginger and daikon scattered over the top and tsuyu in small containers on the side.